I always wanted to be a novelist but knew it wasn't a sure way to make a living. I figured I would follow my sister's footsteps and go to law school. That way, I reasoned, I could make a good living and pursue my passion on the side. I hated every moment of law school. I dreaded the Socratic method. Most of the professors and other students were pompous and unfriendly. I went to school, and went home to my apartment where I studied. I tried to join a few study groups, hang out in the library, join a club or two, make some friends, but I never felt like I fit in. Until my final term. In your final term, you are finished with the required courses like torts and contracts, and with many of the specialized subjects that you might want to practice as an attorney. So I took a course that I simply thought I would enjoy. Advanced Constitutional Law looked interesting. I always enjoyed studying the constitution. After all, it’s our history. Not only the history of the law of our country, but of our government, of our people, and of the culture of the time. 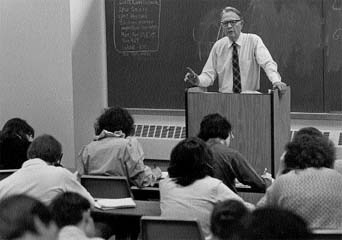 One Wednesday morning, I sat down in a class of about fifteen students. An old man shuffled in. He looked to be an octogenarian. He leaned on the podium in a position that he maintained for the entire fifty minute class. If the podium were to move, I felt certain he would fall. He was difficult to understand. His words were not fully pronounced. The final syllables were garbled. I had to lean in to hear him. This was Professor Telford Taylor as I remember him. I eventually learned Professor Taylor was in his seventies when he was my professor, but he looked more aged. Clearly a man of experience, and of pain, I thought. I barely spoke in Professor Taylor’s class but my attention was rapt. I learned more in his class about the meaning of jurisprudence, idealism, dedication, and yes, the constitution, than I had learned during the two years prior in law school. I also quickly learned why, in a short time, this man made a profound impact on myself and on the other students. Here was Telford Taylor in 1946 when he was a prosecutor in the Nuremberg Trials. The Nuremberg Trials were conducted by the allied forces after WWII. 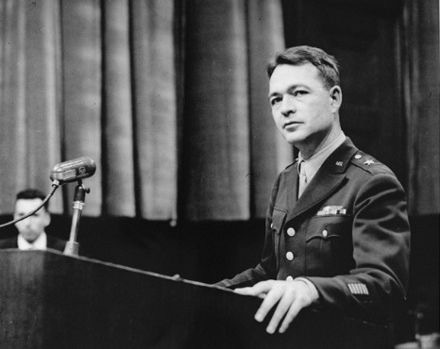 Noted for the prosecution of prominent members of the political, military, judicial and economic leaders of Nazi Germany, they were held in Nuremberg, Germany between November 1945 and October 1946. Twenty-four leaders of the Third Reich were tried. Missing from prosecution were Adolf Hitler, Heinrich Himmler and Joseph Goebbels. All had committed suicide. Prosecutor Taylor didn't believe in an eye for an eye, or punishing violence with violence. He believed in the law as a means to bring members of Hitler's Nazi Germany to justice. Professor Taylor wasn’t a shy man but he was soft spoken. He had high morals and ideals, but only espoused them when prompted, and never irreverently or irrelevantly. When he spoke of his role in Nuremberg, he did so with passion demonstrated with clenched fists, rapid speech, and sparks in his watery eyes. I listened intently every time he spoke, and for the first time during my three years of law school, I became proud that I was going to be an attorney. No longer was I becoming an attorney as a means to an end, to earn a living so I could pursue writing on the side, but to have a meaningful career. I’ve been practicing law for twenty-seven years now and am as proud today to be an attorney as I was while seated in front of Professor Taylor almost three decades ago. In his class, I learned to love the law. I also learned that I wanted to be a prosecutor, which is how I started my career, and where I recently returned to finish my legal career. And our right to tell our government, and others who believe in suppression, that we’re not going to stand by quietly as attempts are made to violate our constitutional rights.